This tea is very finely cut, so it will steep very quickly and pass through many strainers and teapot cages. This is the type of tea that is responsible for the universally-known “a teaspoon per cup” measure that just doesn’t work for so many modern, large-leaf china bush varietals. But this is the tea for you if you tend to prefer that old-fashioned measure of ‘a teaspoon per cup’, because that measure of Monkhooshi Assam will actually weigh the 2 grams that only a Tablespoon of a bulkier tea will weigh! What’s better than a dark, malty, richly-satisfying cup of Indian tea? 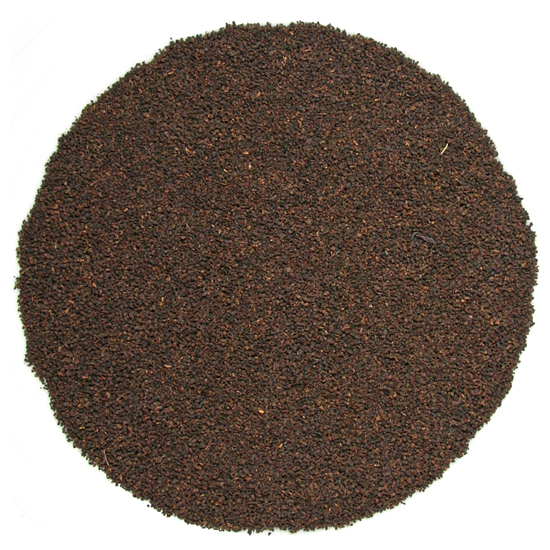 Believe it or not, this is one of our more popular black teas. Whether drunk black and straight up, diluted with milk, cream, or half-and-half, sweetened, ‘spiced’ or not, this is a malty, deeply-flavorful, and satisfying cup of tea. Many of our clients use Tea Trekker’s Assam Monkhooshi black tea as a base tea, into which they blend fine-cut or powdered spices, to create their own, quick-steeping chai. Part of Monkhooshi’s charm is that quick-steeping ability, so that ‘on the way out the door’ or when in a hurry (or if you simply enjoy the style it produces) this fine-cut leaf is modern Assam tea at its flavorful best. Monkhooshi has a bright, malty and rich flavor, classically northern Indian. Not likely to encourage second steeping or much in the way of finesse or subtlety, Monkhooshi is for the straight-ahead looking tea drinker. If you enjoy a tea that bares its soul fully and completely right from the start, then this Assam tea is for you. Note that it is very finely cut so will steep quickly and pass through many strainers and teapot ‘cages’.